The Mobile Airport Authority launched a 120-day feasibility study on February 2018 which determined that it would be an advantage to shifting commercial air service to Brookley due to its proximity to the downtown area and greater access to eastern shore of Baldwin county as well as interstate 10 and highway 65. Fast forward to phase one a year later and we are opening a temporary terminal downtown to provide the community with affordable and convenient air travel. While the Mobile regional airport will still remain operating, we hope the new downtown terminal will give you more options when it comes to flying. Located on the Mobile Bay within the Mobile Aeroplex at Brookley, Mobile Downtown Airport (BFM) is the Gulf Coast's newest airport terminal serviced by Frontier Airlines, conveniently located off I-10. The airport is a great gateway to the global market as well as the thriving economy across the entire Mobile Region. Whether you are flying in or out for business or need to transport cargo, Mobile Downtown Airport offers the facilities and services to meet your needs. 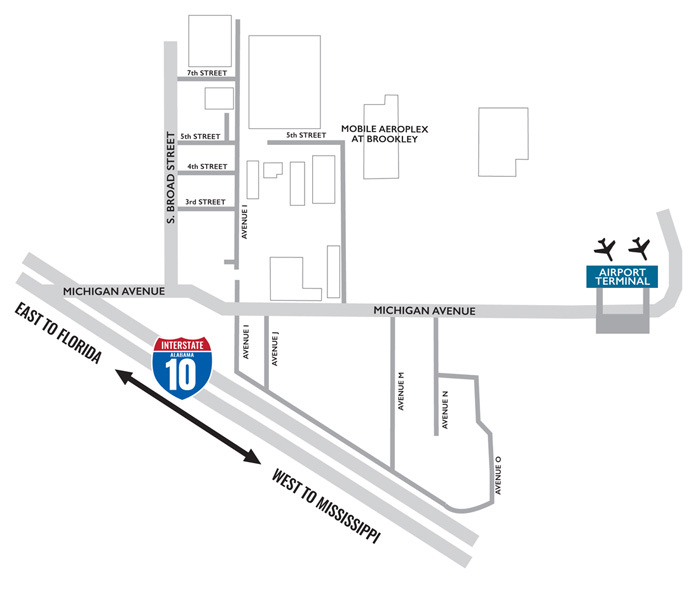 The airport is conveniently located just minutes from Downtown Mobile and immediately off Interstate 10. A full-service FBO (Fixed Base Operation), operates 24/7 and offers on-site aircraft maintenance and repair.